The agreement is subject to ratification by Ukrainian and Israeli parliaments. The Cabinet of Ministers of Ukraine and the government of Israel have signed an agreement on temporary employment of Ukrainians in certain sectors of the Israeli economy and the implementation protocol 'A' to it, which deals with the construction industry. Ukraine's Foreign Minister Pavlo Klimkin described the agreement as "unique"
"It gives thousands of Ukrainians of different professions, such as building trades, an opportunity to work in Israel on par with the citizens of Israel with proper social security and adequate health insurance," the minister said in Kyiv on 7 June. 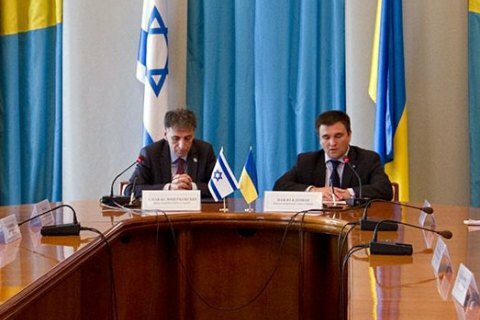 Israeli Ambassador to Ukraine Eliav Belotserkovsky noted the importance of the signing of this agreement, and said that work on the legislation that would allow Ukrainians of other professions to work in Israel was in progress. The ambassador also said that next month Ukraine and Israel are embarking on a third round of negotiations on a free trade area between the two countries. Earlier, Ukraine and Israel have agreed to sign a free trade zone agreement in the first half of 2016.